It really does look just like her! First select your hair bow's ribbon color and then select a charm that looks most like her. 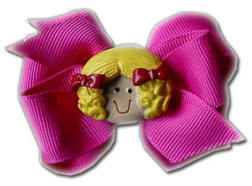 When she gets this bow, she'll certainly declare, "Hey, it looks like me!" These bows are O'Sew cute and perfect to give as a Best Friend present or let your little one wear it as a "It looks like me Bow"! Available in your choice of color's and little sister and big sister sizes.